I’ve practically grown up with the business news channel CNBC in the background (and occasional foreground). I’ve tracked the market and invested in it for many years, learning early on that it felt only a few notches above gambling to me. And, the emergence of fast-pitch shows like Jim Cramer’s Mad Money on CNBC, and how they have become the ratings-winners for CNBC, really left an unsettling feeling in me that I’ve never explored before. So, it was with great interest that I watched Jon Stewart disembowel Jim Cramer on his March 12 show (via my Neuros LINK). Catch the unedited version here while you can, but be aware that its unedited and contains profanity. I have a variety of thoughts that stemmed from watching both the edited and unedited versions of this show, that I explore below. Jon Stewart pushes hard to first establish Jim Cramer as the voice of CNBC, then rip CNBC apart for poor journalism over the course of the interview. Jim Cramer’s argument seems to be that his show is purely commentary/entertainment, not journalism in the slightest. He tries to use this argument to justify that 1.) he was lied to like everyone else, 2.) he’s not the voice of CNBC so Jon Stewart should stop yelling at him. But since he doesn’t come right out and state this (and I don’t know if I would either, if I were him; that specific point would probably be picked up by other media and used to trash his show and ratings), he seems unable to mount a clear defense against Jon Stewart’s points of attack. Jon Stewart plays some relatively damning clips of Jim Cramer being interviewed in 2006 about his days as a hedge fund manager and the short-selling and incorrectly leaked information tactics used by funds to drive stocks down for their personal gain. Jim Cramer’s response to this should have been a clear: “Yes, I did this. Yes, this is what many funds do. Yes, this may not be right. Now, my goal is to expose this to my viewers so they know what is happening.” Instead, he initially tried to lie, then fumbled around for an answer, and finally let Jon Stewart finish his sentences. 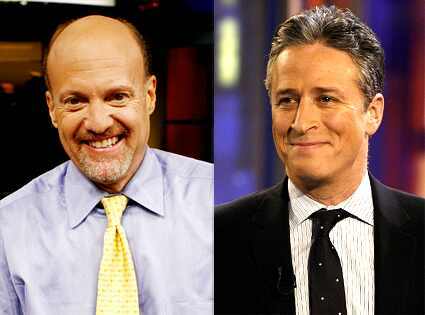 At one point, Jon Stewart asks Jim Cramer, “who are your viewers? The traders? Or..” he trails off, implying the other option as the average American. Which is an interesting question: who are CNBC’s viewers? For anyone who has watched CNBC in the morning or during the day for even five minutes, they will quickly realize that the viewers are the traders, investors, and other Wall Street insiders, and not the average viewer. I believe Jon Stewart trailed off at this point because he recognized the answer to this question himself at that very moment. CNBC as a network is in a tough position. As a news network, they are seen as a source for independent reporting. But their target viewers are the very people who supply them with information and access. If they pushed into investigative journalism, transforming parts of their agency to look and act like Spitzer’s or Cuomo as Attorney General they run the risk of being entirely shut out of all of the companies they need access to. This situation is reminiscent of how the Bush administration treated reporters during the past eight years – if a network posted negative news about the administration, the war, or other areas of interest, they were effectively shut out of the news bubble. This discussion may have been extremely popular for Comedy Central and CNBC, but will the results of this exchange change anything? My guess: on Mad Money, perhaps. You will see Jim Cramer try harder to explain how things work on a slightly more technical level. On CNBC, not as a result of this exchange. You will see broader changes in reporting due to the massive drop in the indexes, however. This entry was posted in stocks, television by Jason Shah. Bookmark the permalink.